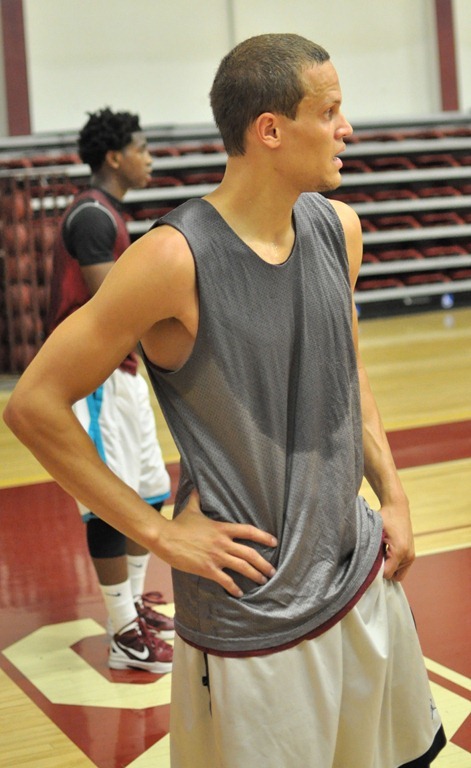 “I will do anything that the team needs.” Skyler Northrup, 6’3”, 185, a 23 year old freshman 2-guard knows that he is fighting for one of the last slots available on a very talented AVC team. Skyler transferred to Antelope Valley College from Weber State University where he unsuccessfully attempted to walk on last year. “They had so much guard talent that there wasn’t a slot for me.” “They liked my effort and potential but not having played high school ball they suggested that I transfer to AVC.” “The Weber State coaching staff felt that AVC’s style of play would give me the experience I needed to transfer to a D-1 school.” Northrup is another qualifier who can transfer to a university at any time if he is offered a scholarship. Skyler moved to AVC and found a room near the college, got a job tutoring a student getting ready to take her bar exam. He has applied for another part-time job as well as taking a full time academic load at AVC. Northrup is a very focused individual. His goal is to play basketball at a D-1 University and beyond if things work out. He will be getting a degree in International Business and is becoming fluent in Spanish looking to the future in business.